Bombings mark resurgence of explosions in the capital since ISIS took over in 2014. 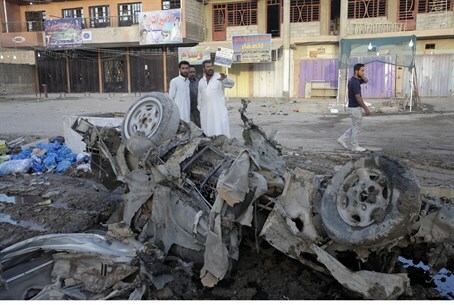 Car bombs in the Baghdad area, including one near a hospital, killed at least eight people on Tuesday, security and medical officials said. One blast hit a car park across the street from Yarmuk hospital in the west of the Iraqi capital, killing at least four people and wounding 10, according to AFP. The second struck a residential area in Mahmudiyah, south of Baghdad, killing at least four people and wounding at least 13. Bombings and shootings in the capital were once a daily occurrence, but have declined since the Islamic State jihadist group spearheaded a sweeping offensive last June and overran large areas north and west of the city. That has tied them down in fighting outside the capital that distracts from their ability to carry out attacks against civilians in Baghdad. Iraqi security forces and allied paramilitaries have regained significant territory from ISIS in recent months, with backing from a US-led coalition carrying out air strikes and training, as well as from Iran. But large parts of two provinces - Nineveh in the north and Anbar in the west - remain under ISIS control. On Monday seven people were killed and 31 wounded in a car bomb blast in Baghdad's western neighborhood of Bayaa, a police colonel said. Another two people were killed the same day by a roadside bomb in Taji, just north of the capital, he said.